A vintage salon style themed event. 1920's, vintage-style dress encouraged. Drinks and appetizers catered by The Produce Station. 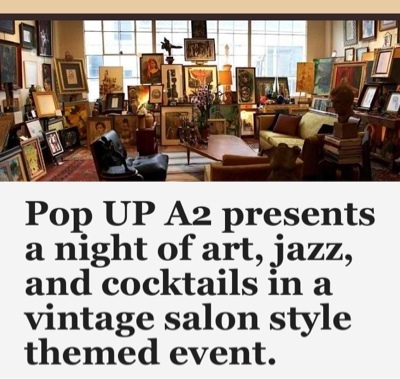 Suggested donation--10% of proceeds obtained by Pop Up A2 will be donated to arts education at The Ann Arbor Art Center. Featuring contemporary artwork by Ann Arbor artists Katie Halton, Adam Bota, Alex Mandrila, Harrison Ptaszek and others. The event runs from 6 pm til 9 pm tomorrow.